As more and more serverless applications are developed, events are now the glue connecting all aspects of modern applications. These events can originate from microservices, from VMs, from the edge, or even from IoT devices. They can be fired for infrastructure automation, for application communication, as triggers from data platforms, or to connect complex analytics and AI services. The value of events is growing exponentially, there are a plethora of diverse sources and consumers of events across public clouds, private clouds, and even at the edge. One of our major Azure innovations last year was the creation of an event-centric serverless platform, Azure Event Grid. 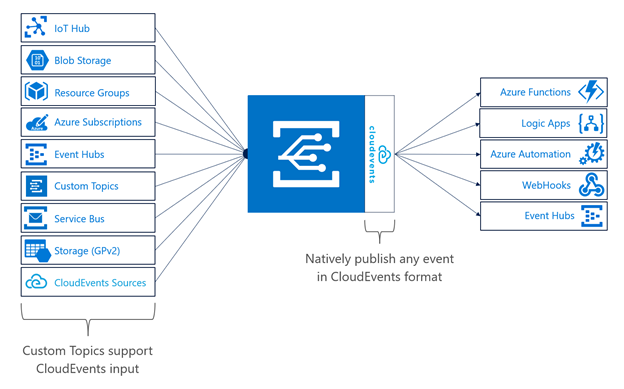 To support the growing diversity of serverless applications, Event Grid was launched with support to use Azure’s native serverless platforms, like Azure Functions, and with support to use custom events, enabling applications to send and receive events whether on Azure or another platform. We are now taking this open and diverse event approach further by being the first major public cloud to offer first-class support for CloudEvents as part of Event Grid. CloudEvents is a new open specification and standard for describing event data in a common and consistent way. Building on this standard will enable interoperability between different cloud providers, SaaS companies, IoT manufacturers, and many others creating a much richer and more inclusive serverless experience. Additionally, this will enable event-based IoT solutions on the edge to take an event-model dependency without being locked to a single cloud provider. You can find a similar approach to this open flexibility with Azure Functions, where we offer a fully open-source service that can run serverless functions on any platform and on any cloud in a Docker container. CloudEvents was created in the Serverless Working Group of the Cloud Native Compute Foundation (CNCF), partnering with numerous cloud providers and service providers. The exciting outcome of having broad support for this open, standard and consistent glue is the opportunity for uniform tooling, standard ways to de-serialize events and universal methods for routing and handling events. In the fast-changing serverless world, this interoperability is incredibly important for agile portability of your applications. Clemens Vasters just showed a demo of CloudEvents on Azure at Kubecon and I am excited to announce that you can now publish and consume events using CloudEvents directly on Event Grid. This allows incoming or outgoing events to use the CloudEvent open standard while still making it incredibly easy to use the rest of the Azure serverless platform, including Azure Functions and Logic Apps. Go ahead and try CloudEvents on Event Grid. It is already available in US West Central, US Central, and Europe North. CloudEvents is being actively incubated and is at version 0.1, so feel free to give feedback, make PRs, and even join the effort in the Serverless Working Group of the CNCF. As with everyone else involved, I am incredibly excited to see this project develop!